Alumni Networks: Hedgehogs or Foxes? Last June I read an interesting post on Cem Sertoglu's blog, Sortipreneur. The title of the posting was Mistakes in Proprietary Networks, and although at first it didn't seem too relevant to alumni relations, the more I think about it, the more relevant it becomes. Useful networks form when Person A needs something Person B has. A system intelligent enough to allow Person A to find Person B is a useful network. The more people in the network, the higher its potential intelligence becomes - and the more paths there are, on average, between network members. As I've mentioned elsewhere, alumni networks are closed "brand community" networks. By definition they have a size limit, and therefore have limited total potential intelligence. One way to increase alumni networks' intelligence is to open them in ways that respect the members' school (or corporate) affinity, while providing access to a larger, open network of far-reaching intelligence. So Cem was right. The internet, as he said, is a "stupid network." But the open social networks at its edge (like LinkedIn, Xing, Facebook, MySpace, Orkut, Viadeo and others) provide intelligence, because they connect people who need to find one another. Our alumni communities do the same thing, but only for extremely limited populations. An ancient Greek poet named Archilochus, wrote (in a phrase made over-simplistically famous by Sir Isaiah Berlin) that "the fox knows many things, but the hedgehog knows one big thing." Our alumni communities are smart like the hedgehog. Each one rolls up into a ball to keep out interlopers. Online, an alumni network knows everything its alumni know, but nothing more. To thrive and grow, alumni networks need the many things the rest of the internet knows. They need us to connect them to the networked world around them. 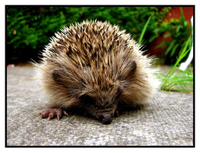 Photo of a hedgehog by David Daniels, used under a Creative Commons license.